It’s another cold Monday morning – if that doesn’t cry out for some coffee, I don’t know what does! 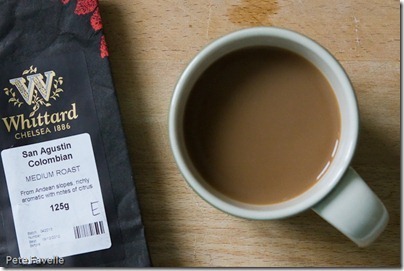 This is Whittard’s San Agustin Colombian, a medium roasted coffee. The grounds look to be quite dark for a medium coffee, which for my strength-favouring tastebuds is a good sign. The aroma, too, is dark – rich, with an almost toffee-like bitter sweet character. Underneath is a sweet but gentle citrus tone – clementines, perhaps. Brewed, the sweetness is curtailed and there’s more of a bitter tone to the aroma. The citrus character is sill there but it’s less sweet – closer to grapefruit now – and there’s a slightly stronger roast character too. It’s a little light in the mouth for my taste, but then it is a medium roast. Roast flavours without any burnt bitterness coming through and those citrus aromas come through in the mouth too, giving a nice, fairly light fruitiness. 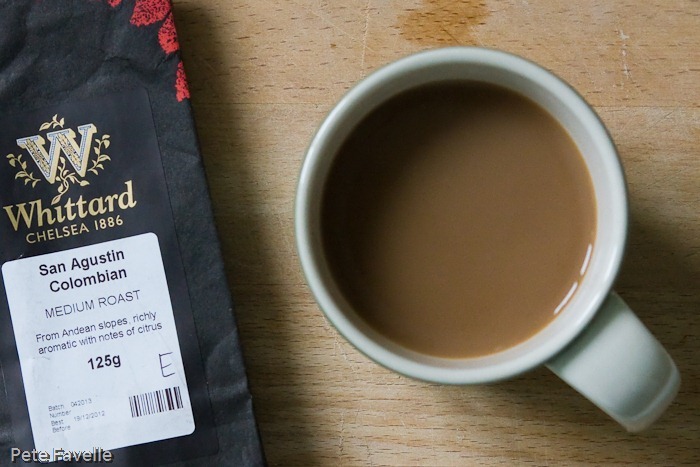 The sweetness is subtle but still comes through and it’s an overall nicely balanced coffee. With a touch more body, this would be a great coffee – as it is, it’s still a very good one and deserves 3 stars. Thanks to Whittard for this sample.